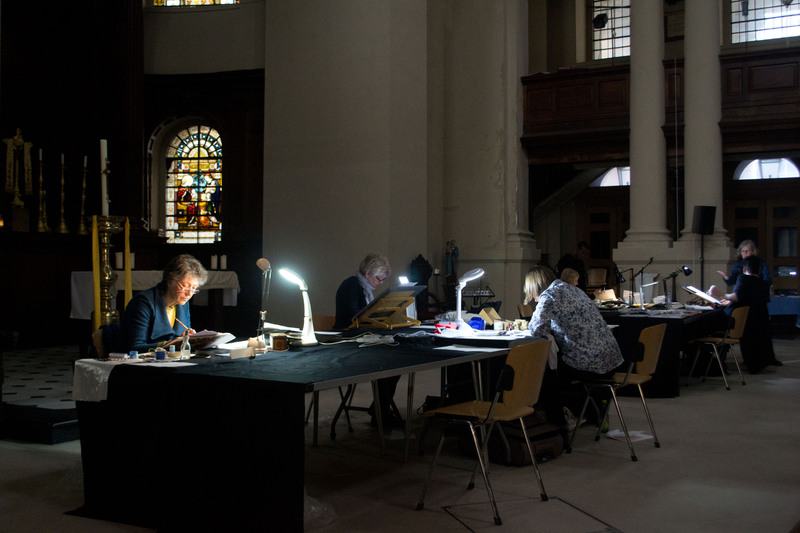 Like medieval monks before us, SLLA members set up a scriptorium in St George’s Church, Bloomsbury on Saturday, 28 April. The medieval scriptorium would have seen the monks working on illuminated manuscripts, Books of Hours and bible pages amongst other things. For this occasion, our scribes took along their own work, and using a variety of tools and materials from quills to brush pens and vellum to wood, they practised lots of different hands. Visitors to the church were encouraged to ask questions and to have a go themselves. Although members enjoyed working in the peace and tranquillity of St George’s, they also appreciated the modern conveniences of underfloor heating and table lamps as well as the tea and cake on offer. A very successful event which we hope to repeat on a future occasion. A full report of this event by Donna Foster will appear in the next issue of The Inc.